I took up the mantle of Perceptions from Rev. Stafford. The daily devotionals are encouraging and uplifting in nature, and many of them bring a smile to my face as I prepare for recording. In addition to the TV broadcasts, Perceptions is also heard on four area radio stations five days per week (KNOE FM 101.9, KZRZ FM 98.3, KJLO 104.1, and KXRR FM 106.1) near the 7:00 a.m. hour. Everywhere I go, people tell me how much they enjoy listening to Perceptions on their drive to work. Additionally, many of our first time guests indicate they heard about us on Perceptions. Perceptions is a vital outreach ministry for our congregation, and I’m blessed to be a part of that outreach. We are making a transition in the Perceptions ministry of which I want to make you aware. Beginning Monday, April 28th, Perceptions will no longer be seen on KNOE-TV. We will, however, now be heard on every FM radio station in the Twin Cities. We move from four to seven radio stations five days per week. Based on the demographics of the company we work with in hosting Perceptions in our area, we can reach more of the people we desire to reach by doing more radio. Who do we hope to reach? The un-churched and the de-churched. It’s a matter of raw numbers. We can reach more people on seven radio stations five days a week than we can with our current design, and we can do it less expensively, too. It’s a strategic decision that will allow us to continue to reach the un-churched in our community, and we can utilize the savings to design new outreach opportunities. So, though my time as a TV preacher was limited to less than one year, I think I’ll be okay with that fact. If it means we have more guests as a result of Perceptions I’ll really be okay with it. Besides, now that we’re webcasting every Sunday, I’m an internet preacher! Maybe internet preachers won’t carry all the baggage that TV preachers do. We live in a different world these days. 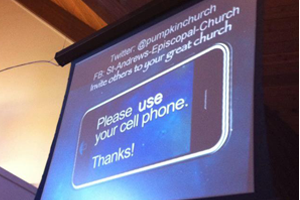 I can remember a time, not too long ago, that cell phones were forbidden in worship. We would look askance at someone who had their cell phone out while worship was going on. “How rude!” we used to think. I don’t think that anymore. Cell phones are not just cell phones anymore. I’m most impressed by two things: First, that they were actually listening, and secondly, that they got the quotes right. I’ve discovered in 23 years of preaching that it doesn’t matter nearly so much what I say as it does what the congregation hears because often what I say and what you hear are two different things. Sometimes it happens because I don’t communicate well. Other times, it happens because the congregation isn’t listening. Most often, it occurs because the Holy Spirit does the interpreting. Remember, there are always three actors in every sermon—the preacher who prepares the message, the person who hears the message, and the Holy Spirit who carries the message. I’m also impressed that the message of the Gospel can be instantaneously sent beyond the walls of the church building. Twitter and Facebook make it possible for my message to be a part of the social network of every person present who communicates via either of those media. That’s absolutely incredible! What it does is multiplies the reach of my message exponentially. That’s a humbling thought, and makes it that much more necessary to be careful in the words I choose to communicate the Gospel. One wrong word, either misspoken or misunderstood, can make all the difference in the world. But, still, Twitter and Facebook (as well as other forms of social media) can be wonderful vessels for sharing the Good News of salvation in Jesus Christ. So, bring on your cell phones. Oh, but do silence them (we won’t ask you to leave like they do at the cinema) so as not to disturb your neighbor, and please, don’t play cards or Angry Birds. You might also keep the selfies to a minimum, too. But, please, use it for your bible, “tweet” me, or Facebook me, but whatever you do, share the Gospel. That’s what disciples do. I began writing a blog when I was a District Superintendent as a discipline meant to replace the discipline of sermon writing. Since DS’s don’t preach every week, I found it was real easy to get out of the habit of sermon preparation. Seriously, a DS could have one good sermon and preach it in a different church each week. I’ve read some of the great evangelists of days gone by would have 8-10 good sermons and would preach them over and over for a year at a time. I rather like the challenge of preparing sermons week in and week out. That’s one of the elements of the work of ministry that energizes me. Blogging became a way for me to keep that habit of weekly preparation. It was also a way for me to vent sometimes, but I always tried to acknowledge that was what I was doing. Now that I’m back in the local church, I’m not blogging nearly as often. Because blogging was a way to keep the habit of preparation, I don’t need it to as much anymore. So, as I’m thinking and praying this morning, I’m trying to capture a vision for what this blog might be. My readership is down now, and I think that’s because I’m not blogging as often. Of course, as I’ve looked back at my stats (yes, WordPress provides copious amounts of statistical information), I’ve discovered that the days I’ve had the most readers is on days I’ve written something that might be considered controversial–the only exception being my tribute post to Rev. Jimmie Pyles that appeared on “theunexpectedds.” That was the most read post I’ve ever written. I’m not writing too many posts that could be considered controversial these days. Oh! I could write some! But, because I’m a pastor (though, not a perfect one), I choose to remain silent on some of the issues facing both church and culture these days. Don’t think I don’t have my opinions. I just choose not to put them out for public consumption. Generating readers on a blog is nothing that strokes my ego. As I seek a vision for this blog, let me share some thoughts on vision. They come as random thoughts from this random mind. Vision is acknowledging what is, and seeing what could be or should be. Vision is the ability to define a preferred future. Vision is birthed out of a time of reflection. Waiting time is not wasted time. God-given vision is birthed out of prayer. Prayer for a God-given vision should soon be followed by planning for God’s vision to become reality. A dream is not a vision. A dream is something we wish would happen. A vision is something we take action to make happen. Dreamers ask God to do something. Visionaries ask God to do something through them. Nothing makes vision more concrete than writing it down on paper. If it’s not on paper, it’s probably just a dream. I don’t know if any of those random thoughts help me define a preferred future for this blog, but there’s nothing quite like processing the whole matter by writing about it. And, hey? Someone reading this might actually share a thought that could become the vision for this blog. Or, my random thoughts on vision might help bring clarity to a vision God is birthing in a reader right now. That would be a worthy result, now wouldn’t it? Might even be a pretty good vision of what this blog could become. Yeah, now I’m just rambling. So, I’ll close now. Experts also say a blog post should be between 600 and 800 words. I’m at my limit. I woke up again this morning realizing how blessed I am. Yesterday was a horribly rainy day in Monroe, LA (actually I think it was a horribly rainy day across most of the Mid-South region). I had to drive through standing water on the roadways just to get to church. I knew worship attendance would be affected (seriously, if I wasn’t the pastor, I would have reconsidered myself! ), and the big, big thing was yesterday was the day we re-scheduled our previously scheduled first-ever “block” party. The first time we scheduled our block party we cancelled because of an ice-storm. This time, I would expect Noah and his family to be the only ones to show up. I was wrong! I met with some of our staff members early yesterday morning, and we determined that we couldn’t cancel again. We decided to move the event from the recreation center field next door into our fellowship hall. I tell you, the event was amazing. Denise Hardy (who pulls double duty as our facilities coordinator and our children’s minister) did a fantastic job in organizing the event. The children had an awesome time playing the games and eating hot dogs…and dancing (my, how they danced)! The music was incredible, too! We have such a talented congregation. Let’s see…Chris and Kim Winterman, Jonathan Putnam, Treina Landrum, Kelsey Malone, Toby Traylor, and even Mr. Beevums himself, Jonathon Bevil, provided us with some great tunes to groove by, and everyone, especially the children, were dancing til their hearts content. And, did I mention volunteers? What a great group of volunteers Denise had organized to put on the event. From set up to service to clean up, the volunteers were amazing and abundant! They served so faithfully, and on a day when the title of the day’s sermon was “Serving Faithfully.” It might have been conviction that had them serving so well, but I rather think it was faithfulness. I’ve written about the incredible staff and volunteers who made the event possible. Now, let me tell you about the incredible congregation that showed up for the event on one of the dreariest days of the year in Monroe. I won’t say they turned out in droves, but there were over 200 people who waded water as deep as 10″ in the parking lot to share the fun of the afternoon. I’ll tell you how bad it was–my wife, Vanessa, even threatened to turn around and go back home as she tried to get out of our neighborhood. Water was over the road it several places, and she was scared to drive through it in some places, but she, like so many others soldiered through and showed up to enjoy the fun. Amazing! Simply amazing…from an incredible congregation. Worship is important because we are made to give glory to our Maker. I have my phone here. It’s a Nokia Windows phone. I use it every day to make phone calls, text, check my calendar, e-mail, and the weather. I even use it as a GPS when I’m driving. Every time this phone performs as it’s designed to perform, it reflects well on the Nokia employees who made it. That’s what great creations do—they reflect well on their makers. And that’s what worship is: reflecting well, or giving glory to our maker—and at least on occasion, gathering with others to acknowledge our gratitude for being made and provided for. The Bible’s opening chapter says, “God saw all that he had made, and it was very good.” Very good things give glory to the one who made them. They can’t help it. Perhaps the most challenging verse in the Bible for 21st Century western culture is found in the book of Hebrews. It’s challenging because it addresses the competing allegiances that vie for our sacred “weekend” time—things like sporting events and weekend getaways. 24 And let us consider how we may spur one another on toward love and good deeds. 25 Let us not give up meeting together, as some are in the habit of doing, but let us encourage one another—and all the more as you see the Day approaching. The Bible says it’s good for us to meet together so that we can spur one another on toward love and good deeds. That’s why we get together. The second reason worship is important is because it’s God’s will for us to gather weekly. We need to “meet together” because when we’re here, we grow and give God glory. Worship is part of spiritual growth. Worship is part of the “core of the core” that we talked about last week. When we’re not here, we’re missed and everybody else who’s gathered is missing something because one of us isn’t here. We need what meeting can do for us. Gathering weekly for worship is a primary, foundational habit, because it resets our priorities every week, before the week begins. My DVR freezes up from time to time. The cure for its ailment is to unplug it for 30 seconds (according to the technician on the other end of the phone). I’ve often wondered why 30 seconds? What would happen if I plugged it back in at 29 seconds, or left it unplugged for 31 seconds? Regardless, unplugging the DVR resets it, and it has to be reset occasionally to function properly. Our lives are a non-stop blitz of messages and inputs. We read books and magazines, we watch television shows, we listen to the radio while we’re driving and to our smartphones while we’re exercising or doing whatever. All of these inputs are telling us something about life. “Vote ‘em off the Island” shows communicate a certain way to win. Sit-coms and dramas tell us how they think we should dress and talk and treat others. We may not agree with what they say or how the people on those shows act, but the DVR that is our memory is always running and storing what we see on our mental hard-drive. All these inputs influence us. The average person saw 500 ads per day in the 1970’s. Today, the average person sees 5,000 ads per day. Our brains absorb every message. Many of those messages distort our view of God, other people, and the world around us. Worship is the place to clear up the distortion. It’s good to be reminded that we’re not the center of the universe, that the one with the most toys doesn’t win, or that the things we buy, try, taste and wear aren’t going to make us happy over the long haul. Worship is a reminder that this is my Father’s world. In worship the songs, the message, and the people remind us that despite how we’ve seen people treated all week, people matter to God and ought to be treated with respect and dignity. In worship, we’re reminded that we are significant and that God has good plans for us. Worship reminds us that God has a purpose for all of us, and it reminds us that He wants to use us in bringing salvation of His creation. Worship reminds us that character matters and the Lord wants us to act with integrity, honesty, justice, love, joy, peace, and patience. In worship, we get the interior of our soul reset, and our priorities can be repositioned. How do I place my “walking around life” before God? I’ll answer that in a minute, but first let me clue you in on something. This “offering” we put before God, many other translations say “your spiritual act of worship.” That word “spiritual” literally translates as “logical.” Paul is saying the most logical thing we can do is worship God because of all that God has done for us. Back in Paul’s day, the Jews still worshiped God by bringing a bull, a ram, or a lamb, or pigeons or doves to the altar in the Temple; slit its throat; and then placed its body on the altar as a sacrifice. The difference for us is, instead of being a dead sacrifice, our logical response to all that God has done is to become living sacrifices. We are walking-around sacrifices that give God honor all day long. Some people believe worship only takes place in church on Sundays. Sunday worship is incredibly important, but from God’s perspective, worship is more than that. Let’s put it this way–worship is a verb. Worship is not a noun that describes a person, place, or thing. It’s a verb that describes an action, something we do. Honestly it’s really not something we “do”, it’s part of WHO WE ARE. Like my phone gives Nokia credit by doing what it does well, we give God glory by doing everything we do well. Have you ever worshiped while doing household chores? Our attitude while serving can please or displease God. Tomorrow morning, when we get up, we can give God glory by saying, “Thank you, Lord, that I get to live another day.” When we get in our car, we can give God glory by how we drive to work, and the attitude we maintain toward the drivers around us (I never preach a sermon to someone else until I preach it to myself). When the car next to us cuts us off, we can choose to give God glory…or not. By all means, if you have a Jesus bumper sticker, or a Christian fish on your car, please choose to give God glory. At work, at school, on the athletic field or social functions, our intensity, our teachability, or attitudes, our openness can all be either acts of worship, or not. Again, the Apostle Paul reminds us in Colossians 3:23: “Whatever you do, work at it with all your heart, as if you were working for the Lord and not for a person.” That is worship. Parents, investing in our children, raising them well, loving them, teaching them to love God is an act of worship. Children and teenagers—how you treat your parents, your attitude when you help with chores, how you treat your brothers and sisters, are all acts of worship. Listen again to how Peterson translates it in The Message: “Take your everyday, ordinary life—your sleeping, eating, going-to-work, and walking-around life—and place it before God as an offering (an act of worship).” That’s how we worship! So, let’s worship. We were made to do it, God asks us to do it, and in view of who He is and all that He’s done for us, it’s the least we can do on Sundays at church and during the week in every aspect of our lives. Worship–it’s at the “core” of who we are!